Asphalt is a great product for the driveway of your home. Ideally it lasts for many years and is mostly maintenance free. But we don’t live in an ideal world and even the highest quality asphalt suffers under attack from the sun, wind, rain and freezing weather. After your asphalt driveway gets to be a few years old you begin to see the effects of this deterioration. Small holes and cracks will appear. Water seeps into these where it freezes over the winter expanding and making larger cracks and holes. If you don’t fix these problems it doesn’t take many more years before chunks start to break off from the corners and sides. At this point it is beyond repair and you either have a very large expense staring you in the face or, if you are thinking of selling your home, have seriously lowered it’s selling value in the eyes of potential buyers. * Small trowel or putty knife. * Gloves and rags to protect your hands and for cleanup. * Asphalt Driveway Sealer (usually comes in five gallon pails which will cover approximately 500 square feet). Determine the total square footage of your driveway and buy enough to cover. If it has been many years since your driveway has been sealed, pick up a little extra because the older, drier asphalt will soak up more than normal. * Asphalt Driveway Crack and Hole Filler (typically is sold in three pound containers). Get the amount you need based on the number of cracks and holes you need to repair. * Sand to fill deep holes or cracks if you have them. Here’s how to get the job done. It isn’t hard, doesn’t take hours and hours, and by going step by step you’ll be done in no time. 1. Clean off all the dirt, grass or weeds that are on the driveway. If you have a lot of grass or weeds growing in the cracks you may want to spray these with a weed and grass killer a week or two ahead of time which will make it easier to get them cleaned out. Use a trowel or putty knife to dig out as much of the dirt and debris as possible from any cracks or holes. Use your lawn edger or a shovel or spade to go along the edges of the driveway and cut away any grass or dirt. Make sure you have clean edges along the entire length and that all dirt and debris is removed from the cracks and holes. Then use your broom to sweep the driveway as clean as possible. 2. Wash the driveway off completely. If you have access to a pressure washer this is an ideal way of cleaning the surface. Use it to clean the surface completely and to blow out any dirt you can from the cracks and holes. If you are using a garden hose, attach a nozzle to the end to give you the highest pressure possible. By doing a good job of cleaning now, you may save yourself a few years before you need to reseal again because you are doing an excellent job now. 3. Let the driveway dry completely and check for contaminants. As it’s drying watch for spots or areas that shine or appear dull from oil or other contaminants that have spilled on the driveway. Get a bucket with water and mix with a cleaner such as 409. Wash these spots off by scrubbing with your broom or a brush. You probably won’t be able to remove the foreign material completely, but the cleaner will help make a better surface for your sealing compound to adhere to. Rinse these areas off completely after you finish cleaning them. 4. 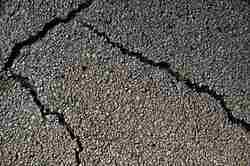 Fill any cracks or holes with Asphalt Filler. If the holes or cracks are deep, prep them by using sand to fill them nearly to the top. Then use your hose to wet these down completely to let them settle leaving them approx 1/2″ deep. You may want to do this two or three times, waiting an hour or two between each soaking. Allow the driveway to dry completely before using the crack filler. Apply the filler according to the directions on the container, but it is important to make sure you get it deeply into any cracks or holes and make sure you smooth the top for a nice finished look. Wait for the filler to dry and reapply another coating if cracks reappear. 5. Apply the driveway sealer. Now that you have all the difficult preparatory work completed, this will seem like the easy part. The ideal situation is to pick a warm cloudy day. This will allow the sealer to flow on smoothly without drying too fast. Pour a moderate amount of sealer onto the driveway and spread it out evenly with your broom or foam mop. When you have a workable area done, pour out more and keep going. You should follow the directions on the container for the product you are using, but once you get started you’ll get a feel for how much sealer you need to get a nice even coat. (If it has been many years since your driveway has been sealed you may want to apply two coats.) Rope off the driveway to make sure no one walks or drives on it until it is completely dry. And that’s all there is to giving yourself a brand new looking beautiful driveway! This is one job that really gives you a good sense of well being and payback since you see the results of your work every time you come home and drive into the garage. Put a smile on your face and add value to your home by taking these simple steps to take care of your driveway.